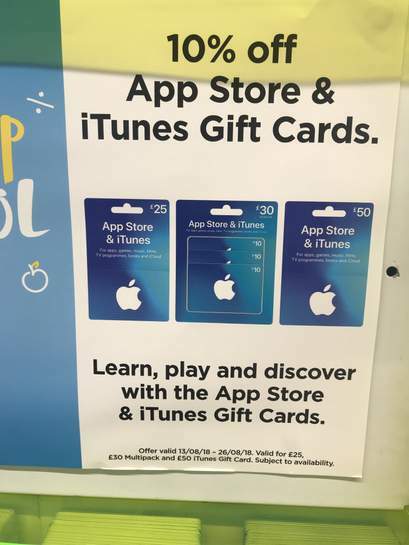 £25, £30 (3x£10 pack), £50 and £100 cards ONLY in Tesco. It is 10% OFF at the till - not extra iStore credit as most recent offers! Great. I use those cards for 10% discount for my Netflix subscription which I run via iTunes. This is online on the Tesco gifts website as well by the way, probably worth updating the title and top entry? You wont get clubcard points buying gift cards ushually but If you get a tesco current account and use the debit card you can still get them which makes this even better. also download the pay plus app for even more points. I can not add any type of iTunes gift card to my basket online. I can add all other types like eShop gift cards just not iTunes. Is it just me? I can not add any type of iTunes gift card to my basket online. I can add …I can not add any type of iTunes gift card to my basket online. I can add all other types like eShop gift cards just not iTunes. Is it just me? 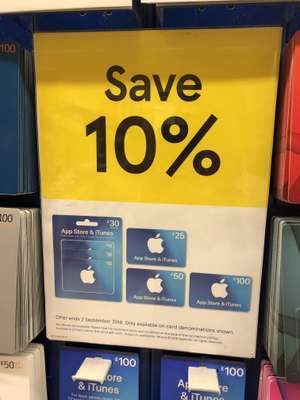 If you are a Tesco employee, you can get 10% off itunes all year round via the Tesco reward Gateway website. Along with lots of other discounts. What did the guy say to deserve that? I think there is a postage cost though with online. I chose digital delivery which is free. They just send you a PDF. They seem to be much quicker than usual today, came through immediately. Might use this as part of a stocking filler for Christmas.